1st item: ROBINSON, Samuel. 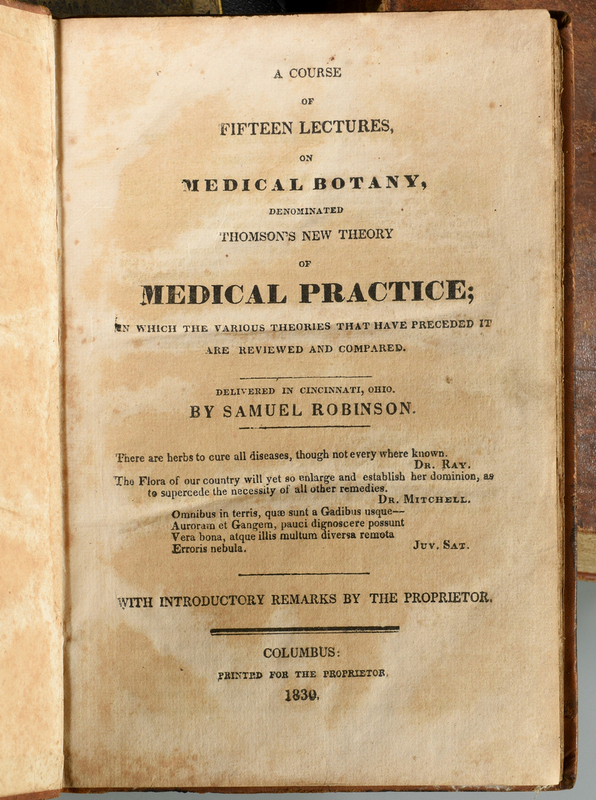 A Course of Fifteen Lectures, on Medical Botany, Denominated Thomson's New Theory of Medical Practice; In which the Various Theories That Have Preceded it are Reviewed and Compared. Columbus: Printed for the Proprietor, 1830. 5 1/4" H X 7 3/4" W (Duodecimo). 162 Pages. Second Edition. First with the introductory remarks. Letter to the public dated 1831 as called for. "A Proposition to revolutionize the practice of medicine, by introducing a system of contract between the Dr. and his patients, whereby the present system will be changed, and people will pay for their health instead of sickness (which is the present practice)." From the letter to the public. Overall good condition. Foxing and toning throughout. Boards scuffed and worn, loss to leather on back. Wear and losses to spine. 2nd item: NUTTALL, Thomas. 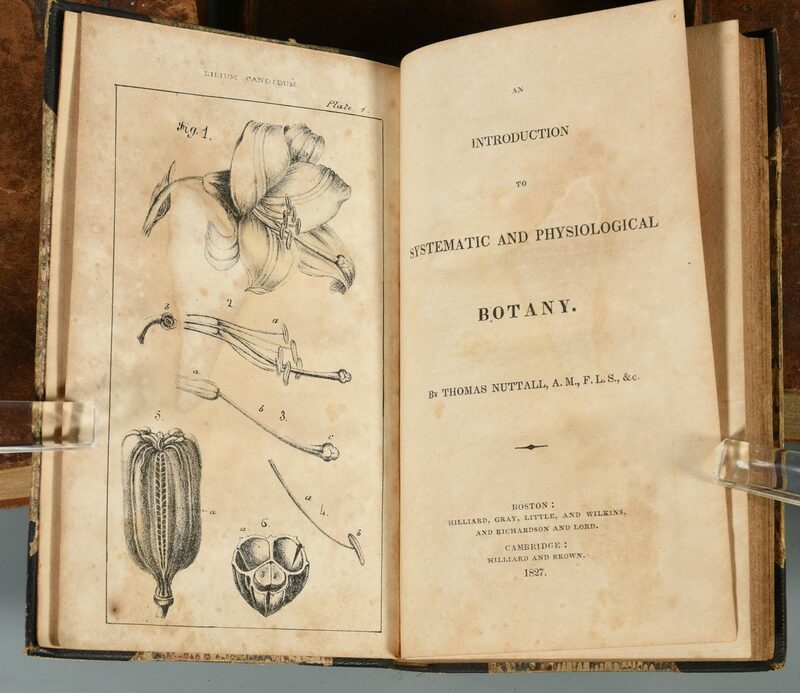 An Introduction to Systematic and Physiological Botany. Boston: Hilliard, Gray, Little and Wilkins, 1827. 4 3/4" H X 7 1/2" W (Duodecimo). 360 Pages. First Edition. All 12 original plates intact. 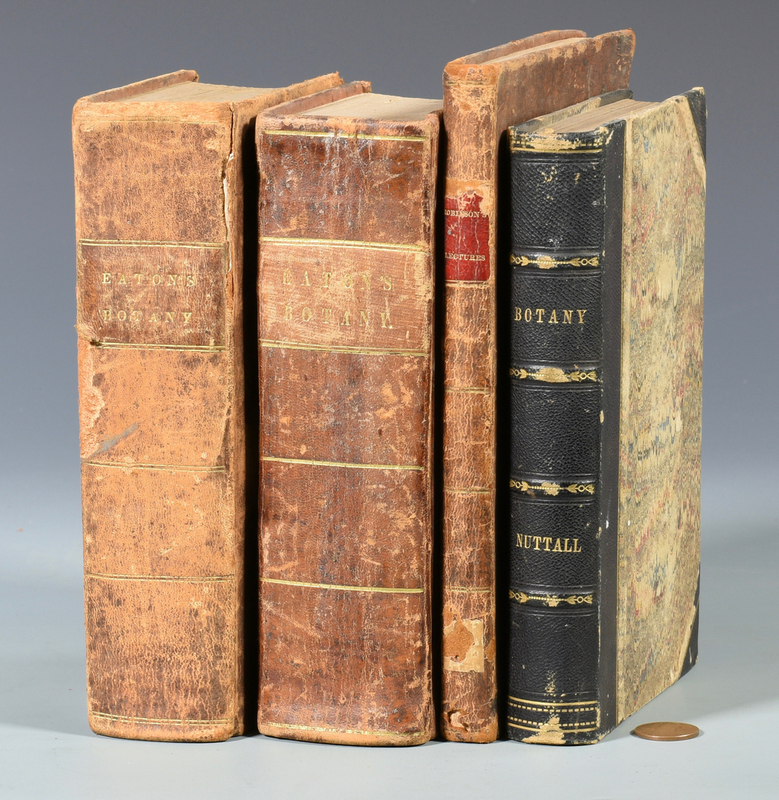 Period leather quarter binding over marbled boards. Four raised hubs to spine. 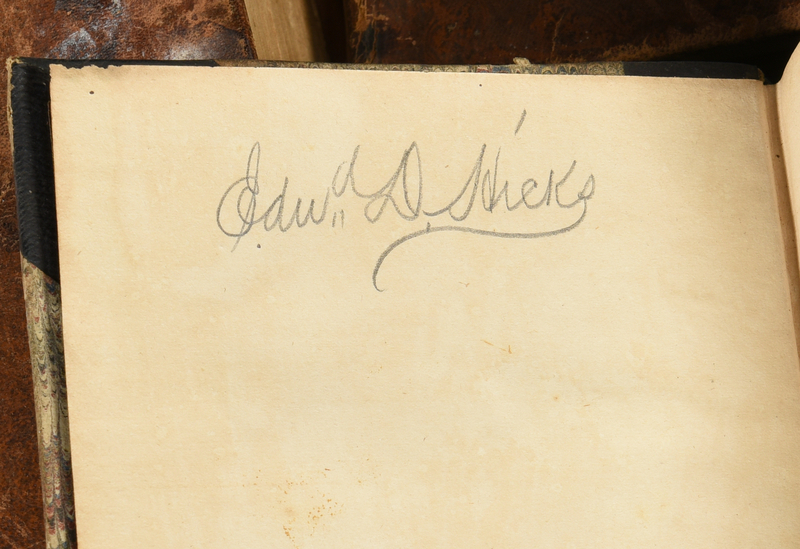 Signed by Edward D. Hicks. Very good condition overall. Scattered foxing. 3rd item: EATON, Amos. Manual of Botany, for North America: Containing Generic and Specific Description of the Indigenous Plants and Common Cultivated Exotics, Growing North of the Gulf of Mexico. Albany: Oliver Steele, 1833. 4 1/2" H X 7 1/2" W (Duodecimo). 103 + 401 + 137 Pages. Stated Sixth Edition. Bound with North American Plants, Arranged According to Jussieu's Natural Method (Part Second). Period leather binding with title in gilt on spine. PO name in ink on front pastedown. Isaac N. Whiting, Columbus (Ohio) bookseller ticket on front pastedown. Overall good condition. A few pencil notes. Foxing and toning throughout. Boards scuffed and worn. Front hinge starting. A sound copy overall. 4th item: EATON, Amos. 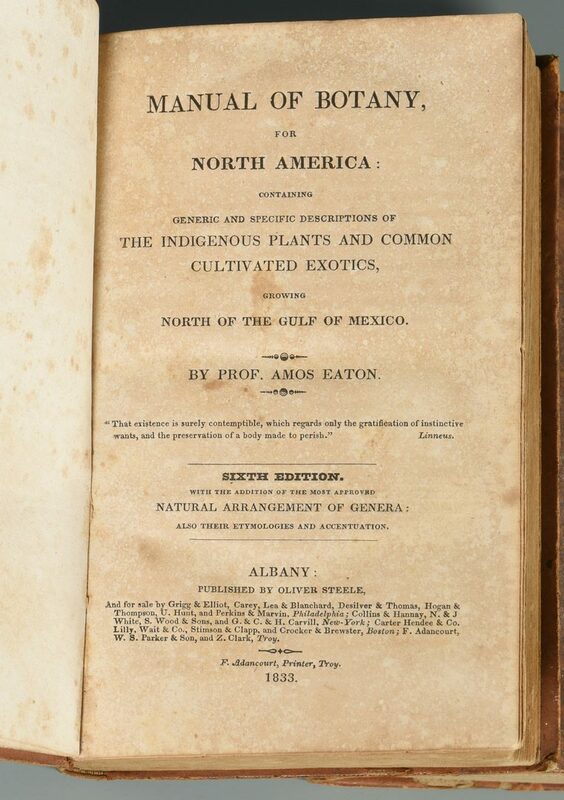 Manual of Botany, for North America: Containing Generic and Specific Descriptions of the Indigenous Plants and common Cultivated Exotics, Growing North of the Gulf of Mexico. Albany: Oliver Steele, 1836. 4 1/2" H X 7 1/2" W (Duodecimo). 672 + 125 Pages. Stated Seventh Edition. Bound with Eaton's Botanical Grammar and Dictionary, Fourth Edition. 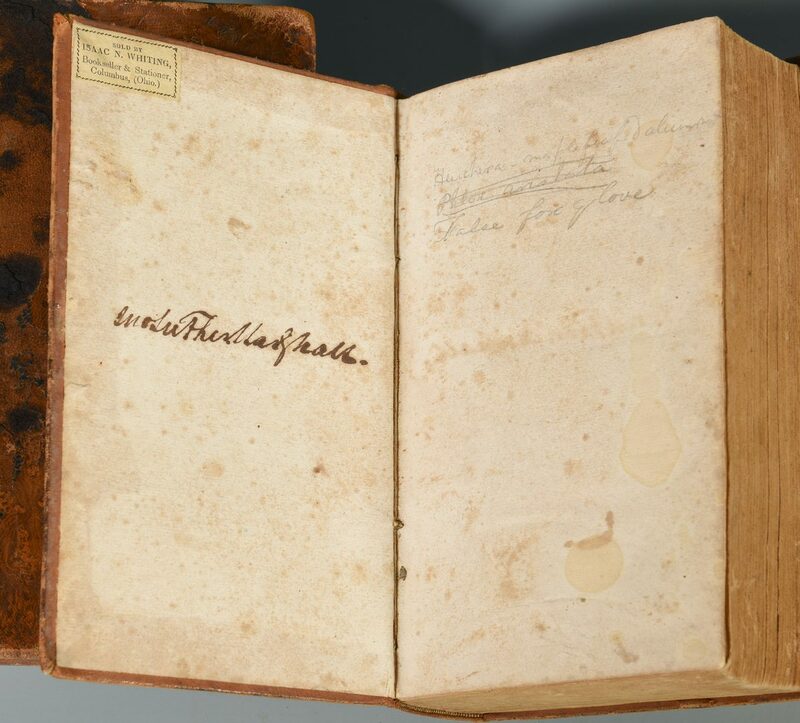 Period leather binding with title in gilt on spine. Eichbaum (Nashville) bookseller ticket to front pastedown. Signed by John Davis on the title page. Overall very good condition. Occasional foxing throughout. Relatively clean and tight copy. Boards scuffed. Provenance: the estate of Sarah Hunter Hicks Green, formerly of Devon Farm, Nashville, Tennessee. CONDITION: See item description.